The Media player is frame accurate. This enables you to view the media clip frame by frame and even comment on it with the same accuracy from annotations. The below image shows the Library Event implementation of the media player. The media player behavior is consistent throughout the mediabank applications with a minor difference in the overlays. The Event overlay below includes both match time in min:sec and the LTC time. 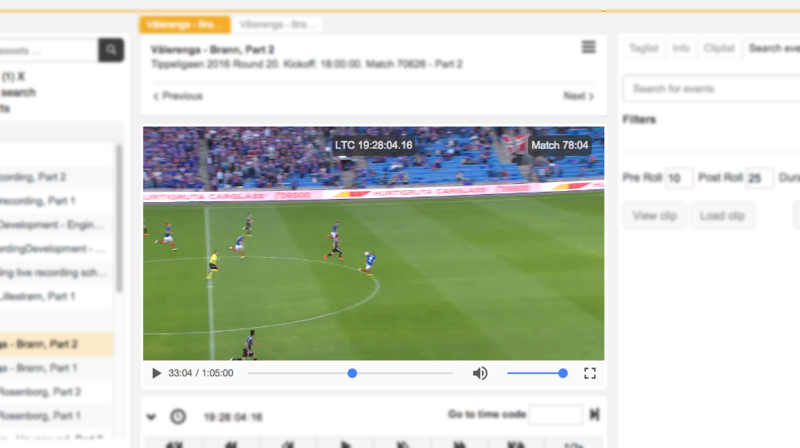 The simple player bar below the player window consists of play/pause button followed by numbers (33:04 / 1:05:00) indicating the length of time the player is within the clip (In this case 33min 04sec [33:04]) and 1:05:00 indicating the total length of the clip (media file). Then followed by a graphic view of the location within the clip. You can drag the blue dot to the left or right to navigate within the clip. The volume level is also adjusted in the same manner. To the end, indicated by a square box, is the toggle switch between the normal (as displayed) and full-size window frame. Observe that the above example is Event showing Match time in min:sec. From Review & Approval the clock overlay would show the time/progress in hh:mm:ss:frames as the LTC.